Your website is your 24/7 salesman. It’s there to impress your customers when you’re not available. Having a website is obviously important to a business — but you might simply not have enough time or resources to build one. 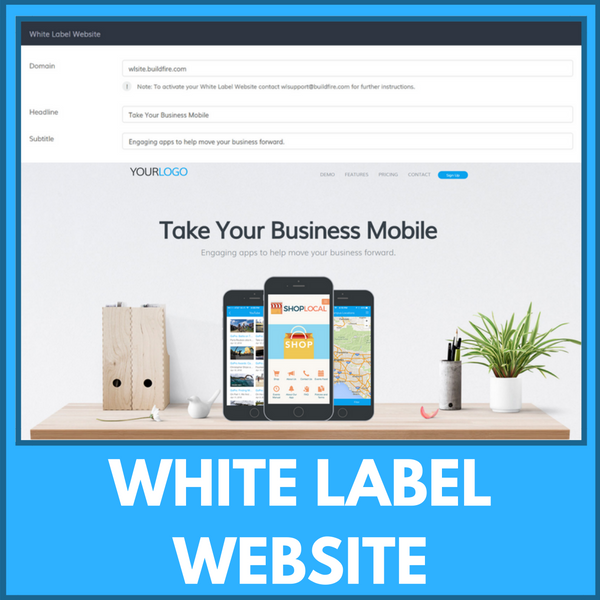 Enter our done-for-you solution: the White Label Website. It’s sleek. Mobile-responsive. And easily customizable. Just as you don’t need coding knowledge to build an app on Buildfire, you don’t need it to build your website either. Before we can get started with setting up your website, you have to email wlsupport@buildfire.com in order to activate it first. Once you do that, then you can start creating your website. Now, moving onto each section of the website. This top section is where you’ll input your domain name, headline, and subtitle. Headline refers to this large bolded text while subtitle refers to the smaller text below it. The subtitle will be followed by an image, which can be changed from down here. This is a great place to put in a slogan and introduce your business a bit. The Intro section features a headline and subtitle, followed by a process. You can click this blue pencil icon over here to edit the process Image, Title, and Subtitle. You can add as many processes as you’d like, the website is mobile-responsive so the images will reposition themselves accordingly. The process can refer to the app building process or how mobile apps can help business for example, but this can be anything you want. 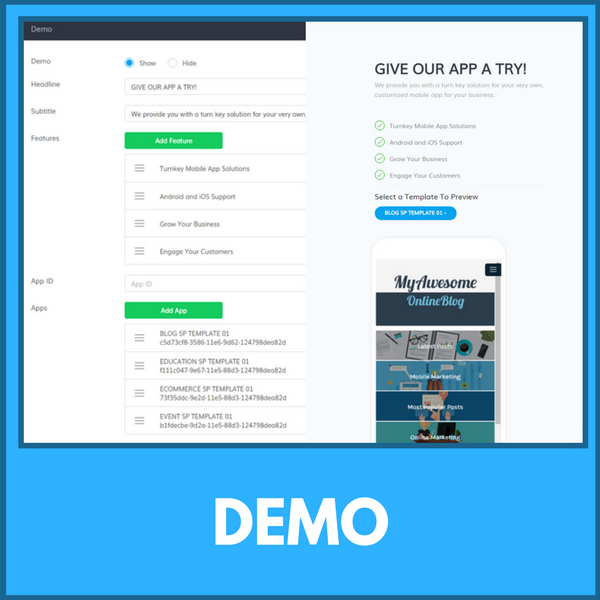 Demo refers to the section that allows your leads to interact with one of your apps. You have the headline, subtitle, features, and apps. You can add some more features by clicking Add Feature. To add an app to preview, you’ll need to copy and paste the App ID (which you can get by going to the App Management section) into this field here, then click Add App. 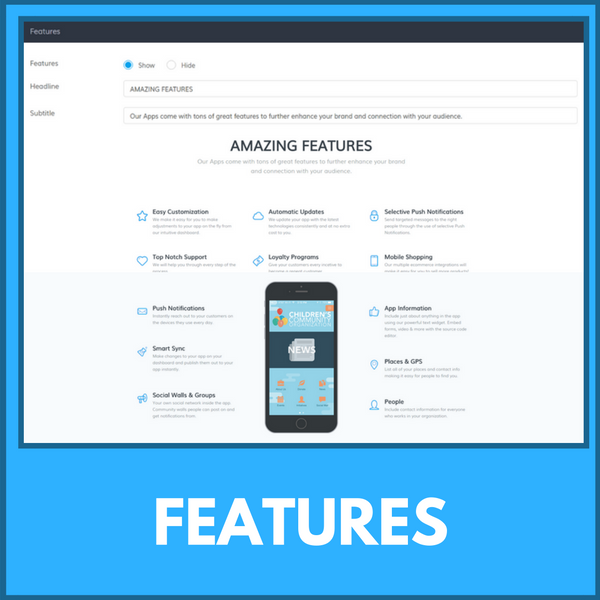 Amazing Features is a section with a Headline and Subtitle. These features underneath are hard-coded into the website and cannot be changed. 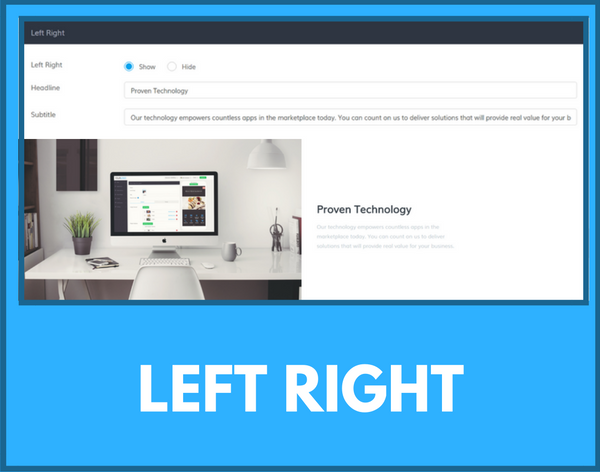 Left Right and Right Left both have a Headline and Subtitle. They both have an image associated with them that you can find at the bottom under the same names. 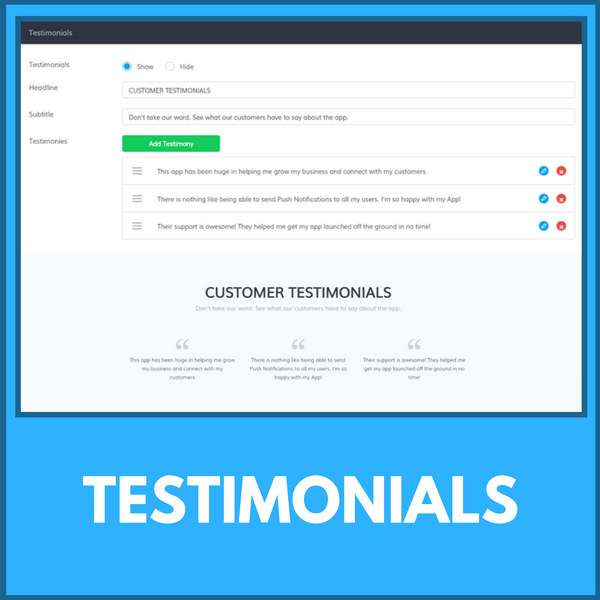 Testimonials lets you put in all the nice things your customers have to say about you. You can send out a survey asking for comments, pull them from reviews and interviews, or wherever. Add Testimony lets you add a new quote, and the blue button lets you edit it. 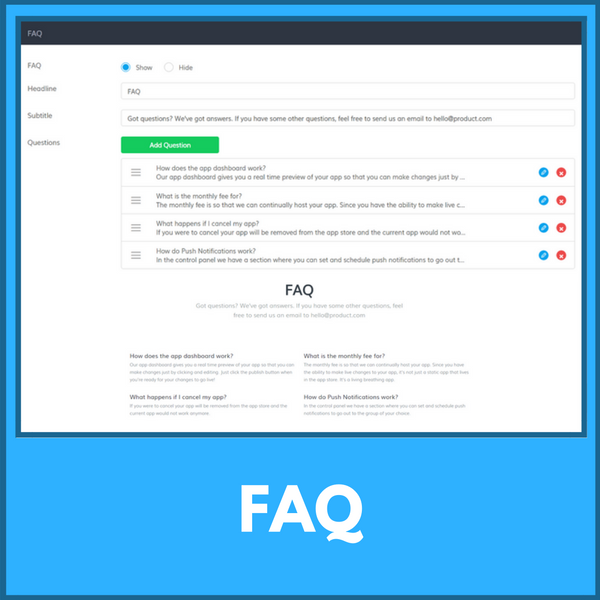 FAQ is our Frequently Asked Questions section, where you can quickly get any common questions out of the way. Just click Add Question and put in the question and answer. The question will show up bigger and bolded while the answer is smaller regular text. 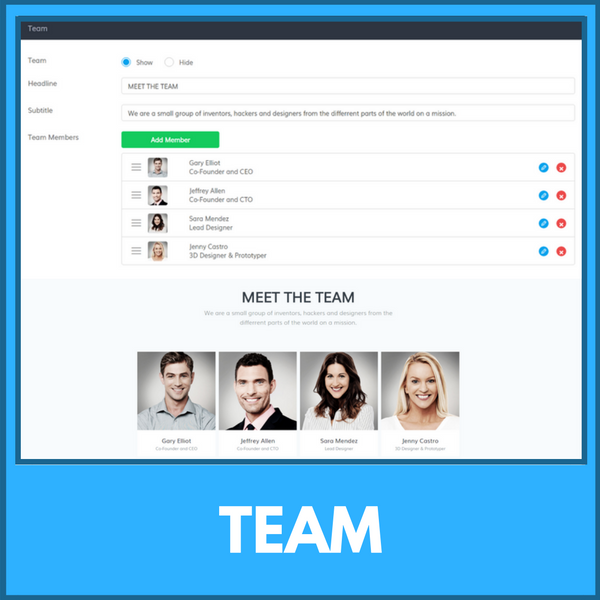 The Team section is where you can introduce your staff to your leads. Each team member has their own image, name, and title. This helps make your business feel more personal. 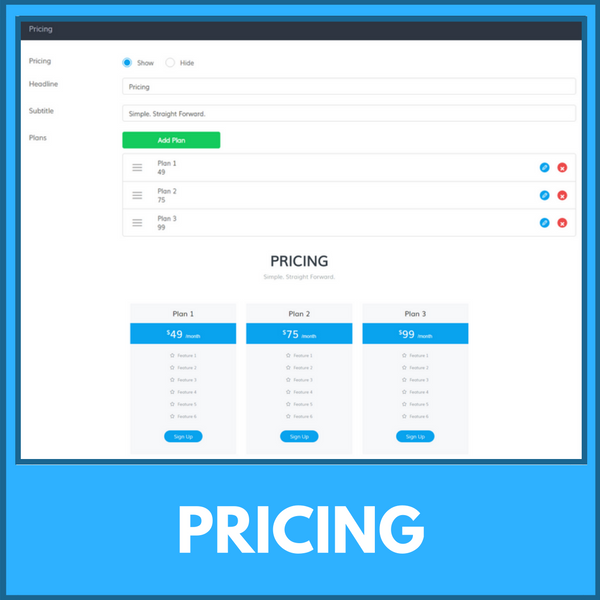 The Pricing section lets you advertise your prices for different plans. Click Add Price and fill in the Title, Price, and Features. To separate the features into separate bullet points, just input a comma in between each feature. Purchase URL refers to the same purchase URL that you would use under DIY > Pricing Plans. To learn more about the purchase URL, check out our video here. If you don’t have DIY, then this should take them to whatever checkout page you’re currently using to charge customers. If this doesn’t apply to you, just click Hide. 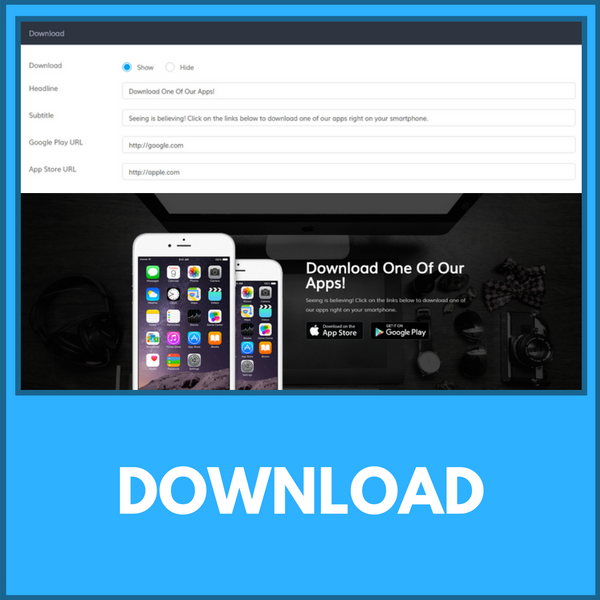 Download lets you insert your an app’s download links. Just copy and paste them here. 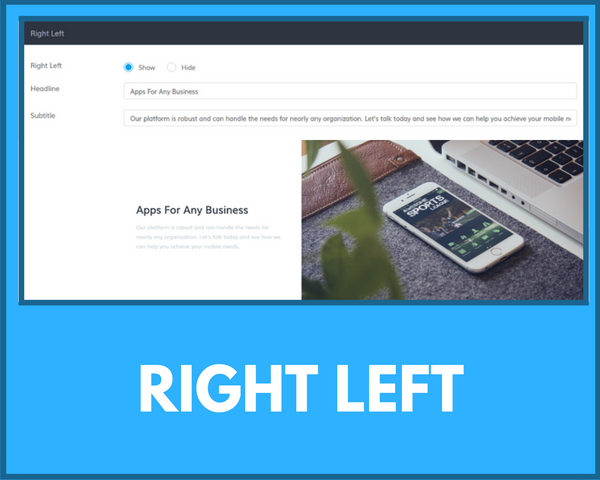 We highly recommend putting an app about your business here, like the one you created for the Previewer App Plugin, but if you don’t have one you can put one of your best demo or client app. 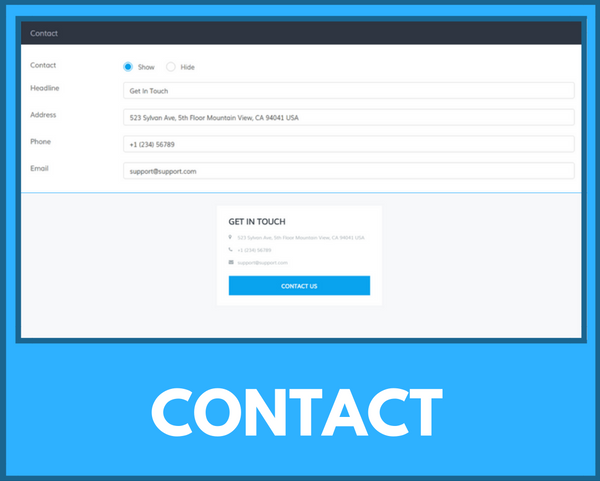 Contact is a section for your location and contact information. There will also be a Contact Us button here that will let them send an email to you. This email will be sent to whatever email address you put in this field here. Footer is this row of icons down here that will link to your various social media sites. If any of these don’t apply to you, just delete it or hide the section. Under Business, fill out the Name and support email sections. Sign Up refers to this button on the top right hand corner. We put hashtag pricing here so that it’ll call to the Pricing section of the website, but you can also put a link to a signup page here. 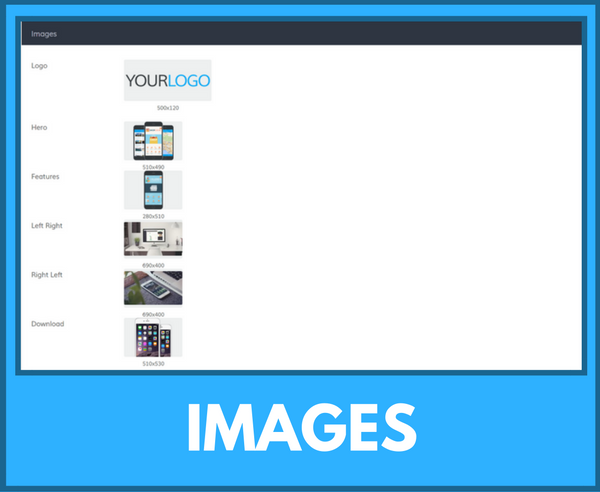 The Images section controls all of the images on the website. The image corresponds to the name of the section next to it. And that’s it for the White Label Website. 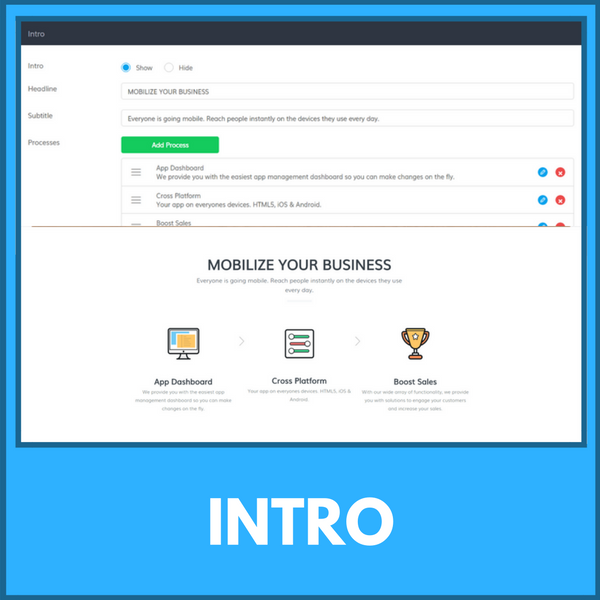 I hope you found this tutorial useful and that you’re ready to start building our your website. If you have any further questions, please email wlsupport@buildfire.com. 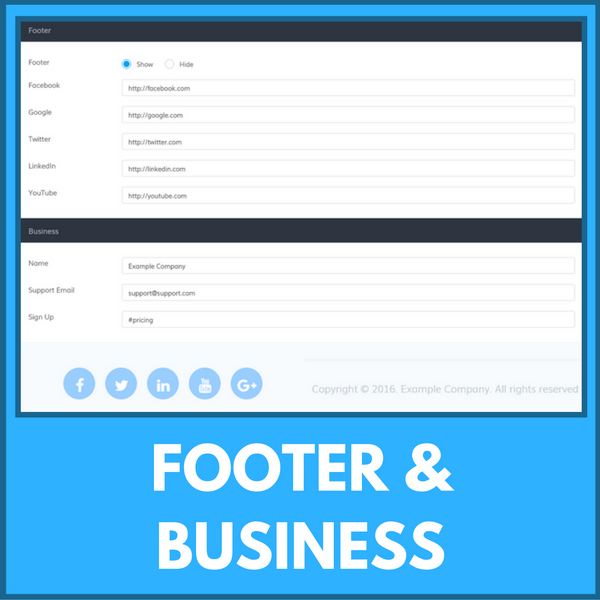 Reseller On Boarding: Welcome to BuildFire!